It’s been a pretty good 12 months for Jonathan Siegrist. 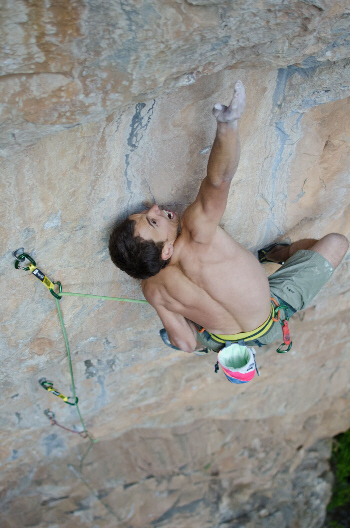 In the last year he’s done the FA of routes like Pure Imagination (5.14d) and Twenty Four Karats (5.14c) in the Red River Gorge and New World Order (5.14c) at Little Si, and he’s repeated routes like Necessary Evil (5.14c), Just Do It (5.14b), Bad Girls Club (5.14d), The Crew (5.14c) and Waka Flocka Flame (5.14c) among many others. Siegrist’s next stop is Kentucky’s Red River Gorge, but before that he had some unfinished business to take care of in Rifle, CO. After trying unsuccessfully to repeat Tommy Caldwell’s Tomfoolery (5.14b), he had turned his attention to an undone line bolted some time ago by the visiting Nico Favresse. Colorado, and certainly Rifle, have a reputation for stiff grades that I feel I should uphold. Like I’ve mentioned previously, I think that the best thing we can do with grades is take them lightly, remain honest and strive to keep consistency within an area. To me, ‘Kryptonite’ remains the standard for 14d on the Western Slope and as much as I would have liked it to, Shadowboxing can not rival it’s difficulty. Even at 14c, the route is still beautiful, burly and waiting for suitors – I’m definitely still psyched, are you?! As usual, you can read the full, very excellent report right at Siegrists’ blog.